Save Time With This Simple And Delicious Chicken Pesto Pasta Recipe! Autumn is almost here, and now is a great time to check out some delicious and simple fall recipes. Try this great Chicken Pesto Pasta recipe! It is full of rich, yummy flavors that will have everyone in your family asking for seconds. Create your pesto by placing the basil, walnuts, garlic, salt, and pepper into your food processor or heavy duty blender. Blend them together and then add in the olive oil and parmesan cheese until the mixture reaches your desired consistency. Use a mallet or a hard object to flatten out your chicken breasts to approximately 1/4″ thick and grill for several minutes on each side until they are fully cooked. Alternatively, you could cook them on your stove top. Next, make your pasta according to the directions on the packaging. When the pasta is finished and you are ready to serve your meal, combine the hot pasta with the pesto, tomatoes, parmesan cheese, chopped walnuts, and cooked chicken. Then, dig in! Discover The Secret to Cutting Your Decorating Budget With DIY Fall Decoration Projects! The Secret to Cutting Your Decorating Budget With A Cool DIY Fall Decoration! Can you believe that summer is rapidly coming to an end?? It feels like just yesterday we were enjoying the first days of summer vacation. Now, it is time to slowly transition to autumn. That means jeans and chunky sweaters, pumpkins everywhere and in every food you eat, the leaves changing colors, and those slightly chilly autumn mornings. As we transition to fall, now is a good time to start thinking about autumn decor. Today, we have a super easy DIY fall decoration that will definitely make your home look fall-festive! Check it out. Cut the moss to fit within the hole of your glass jar and the base of your terracotta dish. Then, arrange the small pumpkins and gourds to create a fun fall scene on top of the moss. Use the leaves to add more visual interest to your decoration. Then, place your glass jar over the top of the terracotta dish/moss scene. Voila! There you have your simple DIY fall decoration! DIY Cooking On A Budget: Pull-Apart Autumn Pumpkin Loaf! Although it may be hard to believe, autumn will soon be here! It always bring with it cooler weather, corn maizes, falling leafs, fresh crisp apples, and pumpkin EVERYTHING. If you enjoy pumpkin flavored foods, you will likely love this delicious recipe for Autumn Pull-Apart Pumpkin Loaf. This recipe is fantastic and so simple to make. You can get your children involved in preparing this recipe because it is very easy to do. Begin by preheating your oven to 350 degrees Fahrenheit. Use nonstick cooking spray that contains flour to grease your 8×4 or 9×5 loaf pan. Next, mix together the pumpkin puree, 1/4 cup of granulated sugar, vanilla extract, pumpkin pie spice, and egg. Then, slice each biscuit in half horizontally. In another bowl, mix together the remaining 1/4 cup of sugar and 1 teaspoon of cinnamon. After that, cover each side of the biscuit dough in the sugar/cinnamon mix. Following the aforementioned step, cover each piece of biscuit in the pumpkin mixture and stack each biscuit on top of the next. Once you’ve covered and stacked each biscuit, place them in your loaf pan carefully. Bake until the biscuits are a light golden brown color. Make the glaze by combining the ingredients in a bowl, whisking, and then drizzling over the pumpkin loaf. Enjoy! Brianna Renee Tells You If DIY Eyeliner Really Works- See What We Think! Brianna Renee Tells You If DIY Eyeliner Really Works! Every woman who wears makeup knows that the cost of cosmetics can add up very quickly. But, what if you could create your own makeup right in your home and save yourself a few dollars? Youtuber Brianna Renee recently tested out a DIY eyeliner project and gave feedback on her experience. She found the idea for the project under Pinterest beauty hacks. In her video, Brianna uses non-toxic household colored pencils as her DIY eyeliner. Check out her video to learn more about this DIY makeup as well as other DIY products she created. She chose a really simple DIY Pinterest hacks to try out. As a result, the DIY eyeliner did not work out too well. She used colored pencils as eyeliner and lip liner. In a pinch, this DIY hack would work. However, there are much better alternatives to this hack that actually work. The eyeliner ended up being only lightly pigmented and somewhat crumbly. This isn’t terribly surprising considering that she used a heated colored pencil. We are a little concerned about the health aspect of this hack. While the colored pencil is essentially no different than an authentic eyeliner pencil, the compounds and ingredients used to make the pencils differ. A good, affordable alternative is DIY gel liner that uses activated charcoal capsules, Vitamin E capsules, and aloe vera gel. You can check out this video to learn more. How To Save Money on Decorations By Making Awesome Melted Crayon Art! Do you like creating DIY wall art for your home? There are so many fun and creative things you can do to make your own home decorations. Also, you can use many household items to create works of art. Today, we are going to tell you how to make melted crayon art. Never Suffer From a Messy Laundry Room Again. Learn How To Create Your Own Laundry Pedestal! 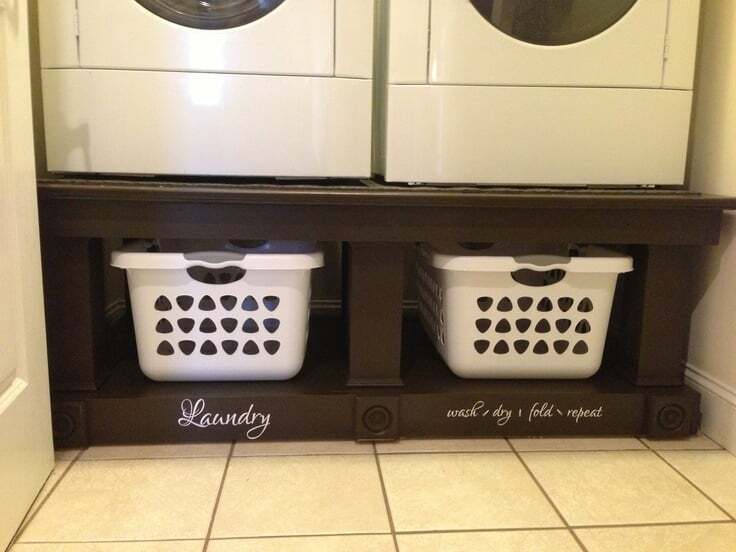 Did you know that you can easily and affordably build a laundry pedestal right in your own home? It’s true! It is very inexpensive to create your own and customize it to your specific tastes. These laundry room pedestals are also functional and helpful with organization. You can use them to store your dirty laundry before your wash it or your clean laundry after it comes out of the dryer. It should cost your approximately $125 and take 2 days to complete. Check out the list below to find out what supplies you need to create your own laundry pedestal! Measure to the specific perimeters of your washer and dryer. 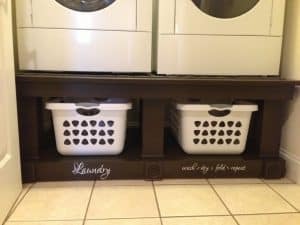 You can find complete directions here to learn more about how to build your own laundry pedestal!